It is becoming more and more common in Electrathon for competitors to heat their batteries. For the purpose of this article I will not try to argue the pros and cons of heating verses battery output, but I will attempt to address a safe way of doing it. Please keep in mind that any open heat source near a battery does have the possibility of combustion. During charging, batteries emit hydrogen sulfide gas. It is explosive. The faster the charge rate and the hotter the battery, the more gas is emitted. It is UNSAFE to overheat batteries during charging (or anytime for that matter.) 127 degrees is the ideal temperature, any more than that and the battery will begin to boil out hydrogen sulfide gas. I have witnessed many ways of heating at races, from water bath coffee heating elements to unregulated heating blankets. I have came up with what I believe to be a safe and cost effective system for heating. The complete system can be built for less than $15.00, depending on what you have lying around. The basic heater is designed around a camping cooler to retain the heat and a hair drier to generate it. The main element to keep everything safe is a drier thermostat to prevent overheating. NEVER leave the thermostat out of the design. The results could easily be explosive. You will also probably warp the plates in the batteries from overheating, effectively destroying them. 127 degrees is not that hot, it is about what you would wash your hands in. Parts can be obtained locally at most any appliance repair store. If you are having difficulty locating a thermostat, I will sell you one for $5:00, email me for more info. 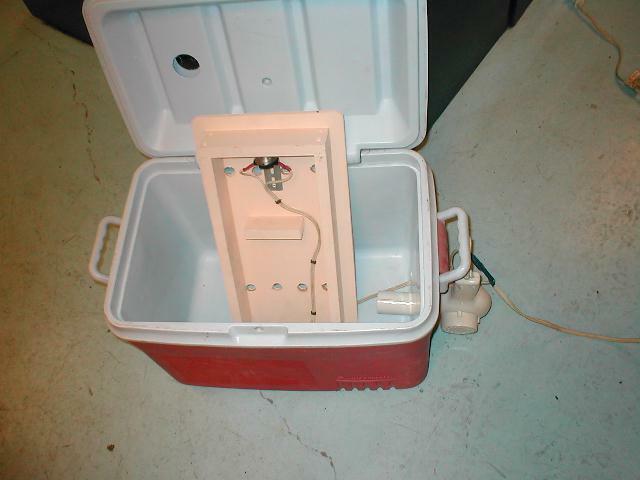 Drill a hole, approximately 2", in the bottom side of your cooler. Size it to fit your drier. 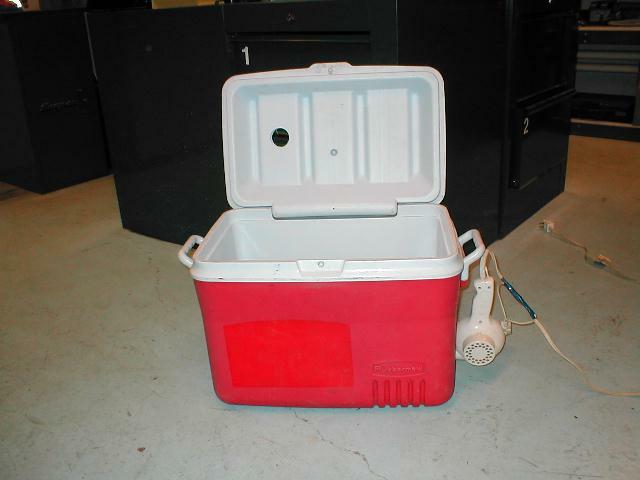 Drill a 2" hole in the top of the cooler to allow the air to escape and to allow your charger clamps into the cooler. Drill a small hole in the side near the drier hole to allow the thermostat wires to pass through. The batteries will rest on a platform built from ¾ inch plywood, just high enough to clear the drier inlet. Drill 1" holes in the platform for the air to rise up through. Add 3/8" slats to space the batteries up off of the platform for air circulation. The drier thermostat fits in the cavity on the bottom of the platform. Separate the two hair drier wires and cut one of the two wires, splice one end to one of the two thermostat wires. Attach the other side of the cut wire to the other side of the thermostat. This will allow the drier to cycle at 130 degrees. Heat the batteries for approximately two days before the race and have the batteries on the charger on low automatic charge while heating. 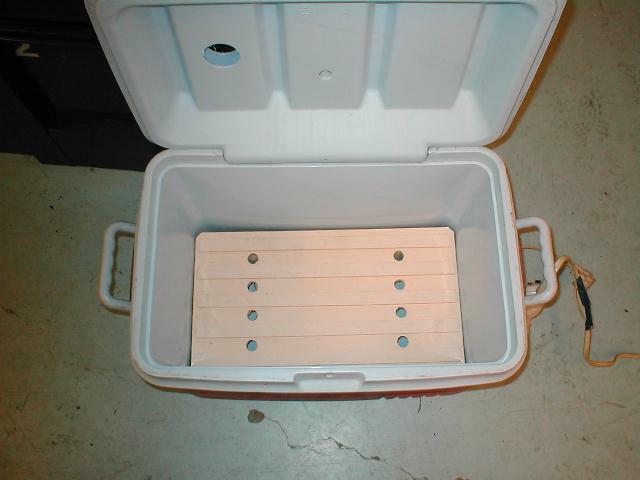 While transporting the batteries to the race plug the holes in the cooler to retain heat. If possible, restart the heater at the race site as you prepare the car for the race. Install the batteries at the last minute in the car.